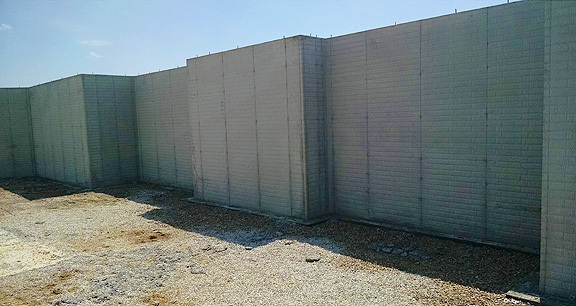 Project obstacles and solutions: Horizon Contracting is a poured wall contractor in southwestern Indiana and northern Kentucky. They were pouring a basement at a new home in Evansville which included stampeded concrete walls. The forms had a brick pattern that would be used as finished wall. It was important that the concrete have a high slump so it would fill all the space in the forms. With a brick pattern, it also needed to produce a finished surface where no rubbing was needed when the forms came down. Horizon used imix EZ Wall, a concrete mix designed specifically for residential wall pours. IMI delivered it at an 8 inch slump. At that slump, no extra water was needed when the mix was delivered. Ed Ravellette, Horizon's owner stated that one of the benefits of using imix EZ Wall is the fact that it is so easy to place, he doesn't often need a concrete pump. This saves construction costs. "If I can get to two sides of a basement with EZ Wall I don't need a pump." Another benefit of using imix EZ Wall on this project was the ability to strip the forms early. On this job, Horizon was able to pour the walls in one afternoon and take down the forms the next morning. The concrete had filled in all of the voids in the forms. None of the walls had any honeycombing or holes that needed rubbing. IMI supplied 63 yards of imix EZ Wall for this project. For more information on using imix EZ Wall, click here.